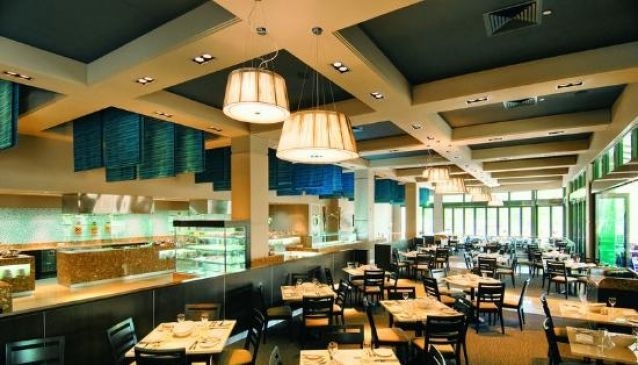 Waves Restaurant in 2009 won the Best Casual Dining Buffet Restaurant on the Gold Coast. It will tempted you with it`s finest foods and superb casual dining, which remains untouched. The Hotel`s stylish Waves Buffet Restaurant has been redeveloped and relaunched October last year 09. The restaurant has many special features, from rich textured collage of oceanic colour, fresh local produce, timber furnishings, cool smooth stone, ambient lighting and dramatic glass and stainless steel fittings. Waves Restaurant provide a popular buffet choice for breakfast or dinner, served 7 days a week. Here are some of the delectable goodies they offer. * seasonal fruits * wholesome cereals & nutritious yogurts * freshly baked pastries * also bacon,sausages, tomatoes * eggs and omelette`s cooked to perfection. Dinner is presenting an aromatic feast of over 70 dishes. * cuisine from the Mediterranean,India,France,Asia,Italy and the deep blue sea * most magnificent luscious prawns,crabs,mussels & oysters are just a drop in the ocean. * an interactive buffet that extends to. * spicy curries * mouth watering stir fries * authentic pastas with fresh salads and far beyond. * creme brulee * tiramisu * triple chocolate mousse cake and the savoury platter with also a cascading chocolate dipping fountian and marshmallows * strawberries & fruits. * $59 pp Friday and Saturdays. Bookings are available on 07 5588 8304 or Book online.